Large lures & baits, solid body swimbaits, jointed baits, wake baits, glide baits, topwater baits, soft jerk baits, fishing lure wraps & more. Your new premium big bait rod. Professional grade for catching big fish. Featuring Dee Thomas' patented Anti-Tangle Guides. You angle for trophy fish. You've got BIGBAIT. 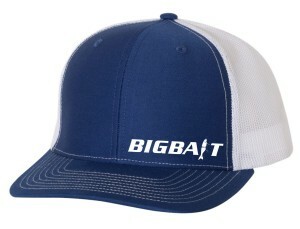 Now get your matching trucker mesh cap, t-shirt and hoodie for good measure. It's how we roll.